The Measure 91 marijuana legalization initiative approved by Oregon voters last November went into effect as of 12:01 a.m Pacific Time today. That means that people 21 and over can now legally possess up to eight ounces of weed at home and grow up to four plants. Only one ounce may be possessed in public. Public consumption remains illegal. But you won't be able to go to the marijuana store just yet. Sales are currently set to begin next year, although there is a chance the legislature could act to move up that date. Portland NORML is marking the occasion with a midnight seed giveaway in Portland. 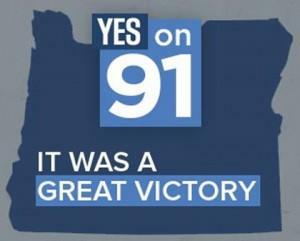 Law Enforcement Against Prohibition hailed the new era in Oregon. Four states and the District of Columbia have legalized marijuana, and 23 states allow some form of access to medical marijuana. At least a half-dozen more states are likely to try to legalize it at the ballot box next year, and it could even happen this year in Ohio, where an initiative campaign has just handed in twice the number of signatures needed to qualify for the ballot.